Be a leader of the pack in addressing driver retention. In a nationwide driver shortage, turnover happens fast. A driver can be happy on Monday, fed up on Tuesday, and they’ve found a completely new company by Friday. Let your drivers speak their mind anonymously to uncover and resolve their issues at the speed of business. They say the shortest distance between two points is a straight line. Straightening out your frontline could mean serious business changes, but anonymous feedback will help you pinpoint the right place to start. Don’t let information get sanitized between the frontlines and your decision makers or wait until an exit interview to understand what went wrong. Get to the bottom of your workers’ needs with feedback in real-time. When health is the priority, make sure the health of your workforce is at the forefront. Preventative check-ups on your staff can prevent triage later on. Early issue detection can help you understand what your healthcare workers need so you can prioritize where to improve your operations. 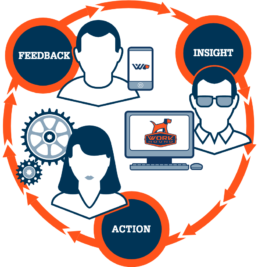 With WorkHound you can get real-time insights from your frontlines and proactively address their issues. Check the pulse of your healthcare staff. Start addressing their needs today. Failure to address worker retention can crush your bottom line. Annual frontline worker turnover rates exceed 50% across the nation. Frontline worker turnover is an epidemic for all business. Replacing a worker and lost productivity can cost tens of thousands of dollars. Constant recruitment isn’t the solution to retention problems. The churn of workers zaps your resources and hits your budget hard. Your frontline workers submit feedback, praise, problems, and ideas with you through their smartphones. We distill that data daily into actionable, ready-to-use insights that help manage and retain frontline workers. Your frontline workers feel empowered, knowing that their feedback is acknowledged, and you get the bottom-line benefit of a thriving, motivated team. When your frontline workers have the ability to give feedback, you’ll see results. But don’t take our word for it. Discover what an engaged, motivated team of frontline workers can do for your company.